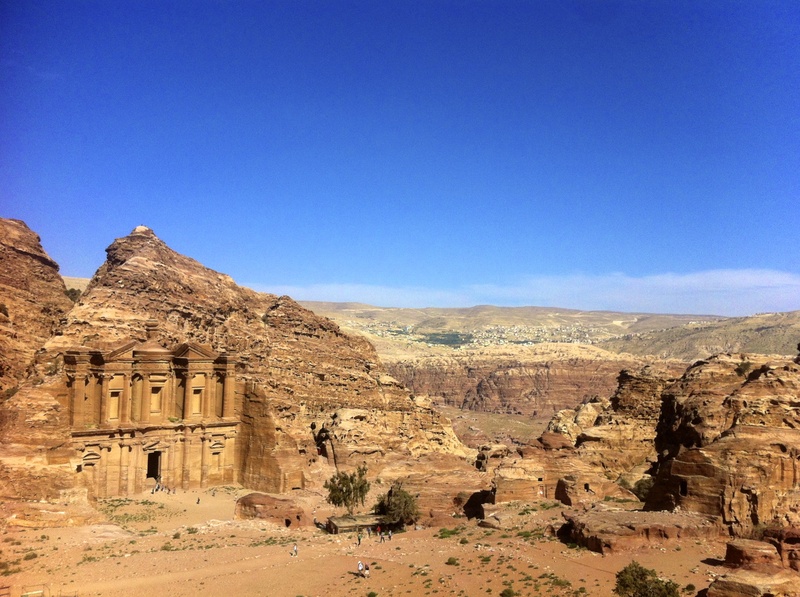 Petra – the ancient city – woo’d us. 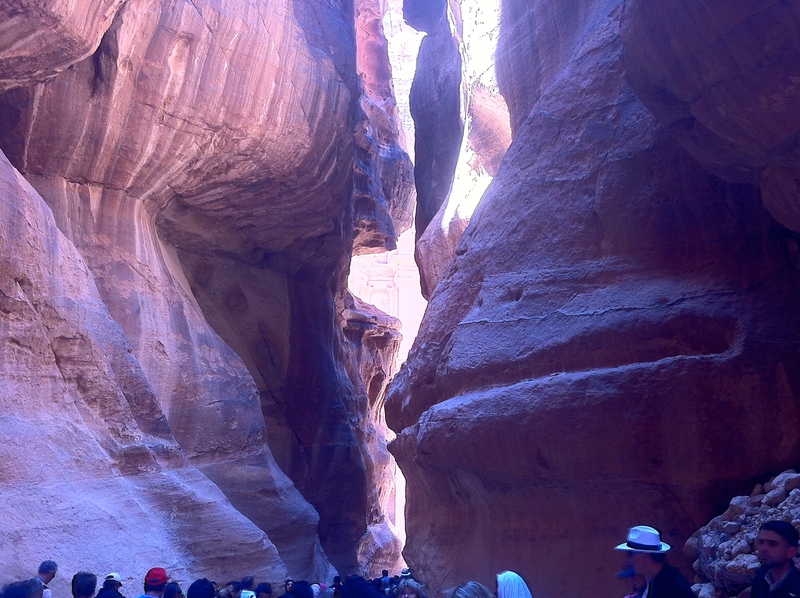 Petra: It’s a whole city of amazing stuff. The Monastery is stunning, and it’s hard to convey how stunning in an image. I wouldn’t hold it against you if you haven’t. I hadn’t heard of it until I stumbled on the second half of a documentary about the place. Turns out it’s one of the 7 Wonders of the World – a giant, sprawling ancient city with several breath-taking structures built 2000-odd years ago. 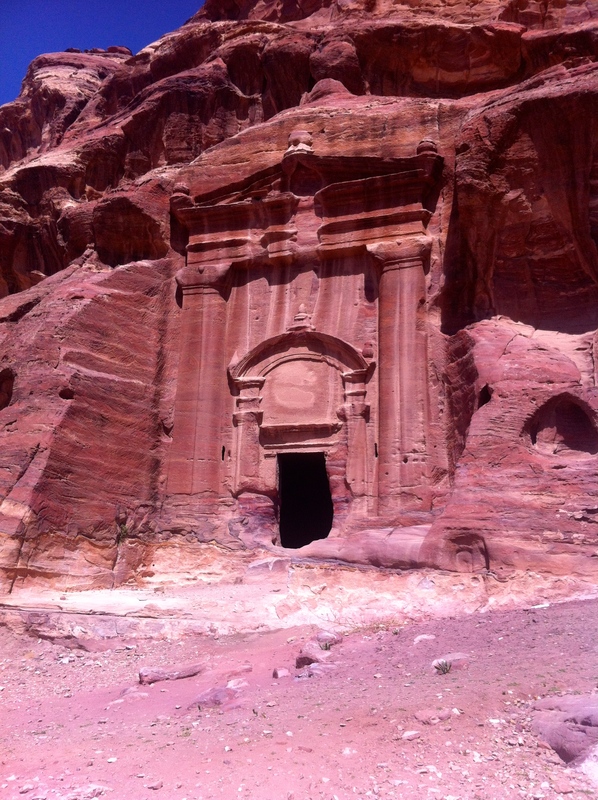 Experiencing Petra, as with any place, is so much better in the flesh. Here’s a super-brief overview of our experience. After driving for 3 hours with 6 people jammed into a car that really only fits 4 (5 seats but it was small), and avoiding paying bribes at the very dodgy police check points, you park wherever you can find a spot and walk to the gate. It’s 50 Jordanian Dinars for entry if you are a tourist (AU$75ish), 1 JD if you are a resident or student and free if you are a Jordanian. ‘The Sig’ is a 2km long crack in a huge rock. It was originally one rock that got split into two by some kind of tectonic event. It is truly magnificent, and you walk between the 30m high walls which are beautifully coloured. 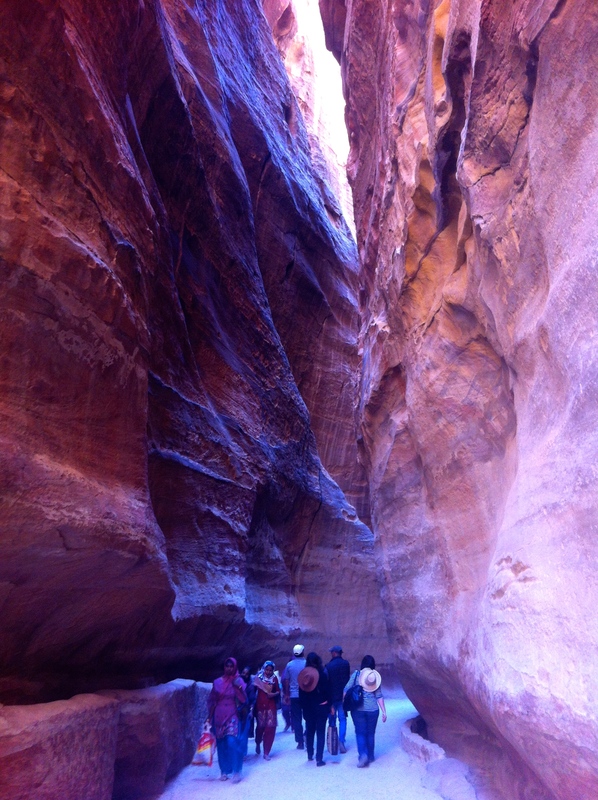 It’s cool here because the deep crevice doesn’t get much direct sunlight. The anticipation builds, too, because you know that at the end of this peaceful 2km stroll is a 43m tall structure known as The Treasury. It’s carved into rock, with a two massive rooms carved out inside of the rock. The scale is not conveyed well in a photo. Any photo. It’s immense. Around 500BC the locals discovered it was easier to cut into the relatively soft rock than build large freestanding buildings. 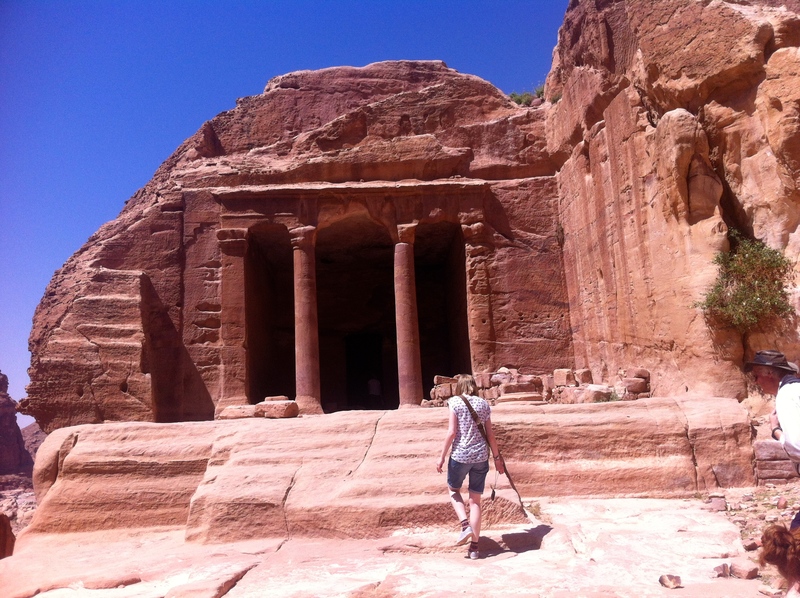 So, the following day or three of hiking is filled with amazing buildings cut into rock. There is so much to see. 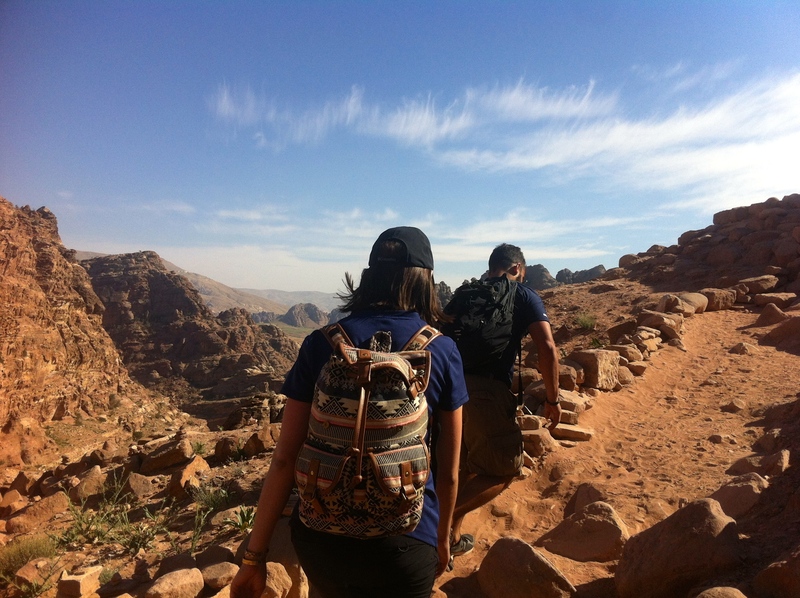 We hiked for one day – it was harder going than any of our many hikes in Jordan because it’s so incredibly steep. But worth it. The High Sacrifice Point is worth getting yourself to, 45 minutes of relentless climbing later and you can just about see the whole freaking world. 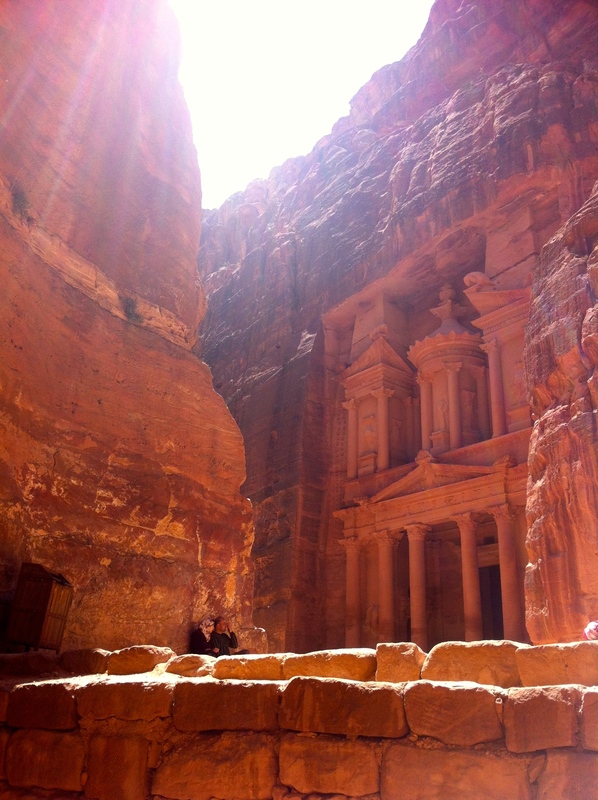 Petra is a city. The Treasury Building is a highlight, so is The Monastery (a similarly huge structure), but there is so much to the place, not just one or two or 5 structures. For example, there is a 8500 seat Roman Theatre, too. And for the engineering students out there, Petra’s water engineering is incredibly sophisticated even by today’s standards. 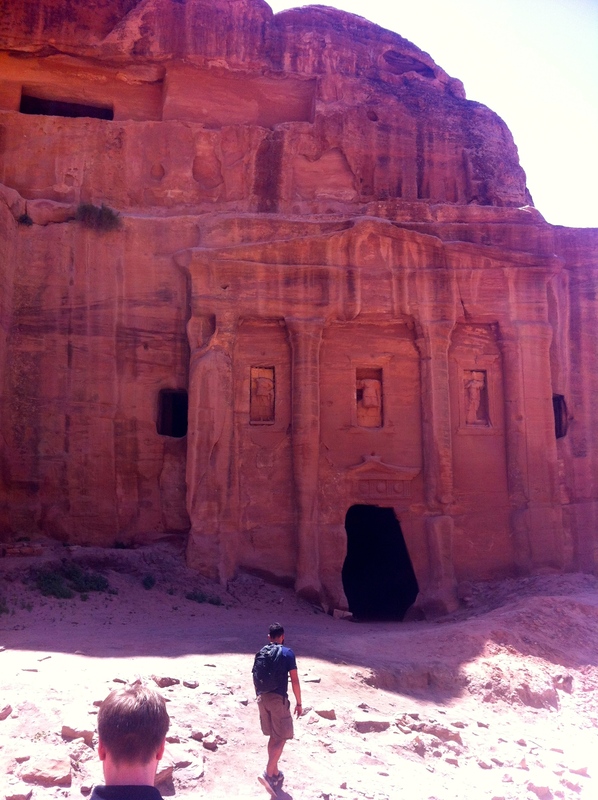 So, Petra is way cool. Go check it out, and then enjoy the meal you have well and truly earned at the end of the day. If you’re unfit, you can ride a camel, horse or donkey. The donkeys even climb up and down the mountains – I’m sure it is terrifying but I guess it’s a little easier physically. Friends from Canberra: Until you hear from us again please go to the Australian War Memorial, the National Museum, the National Gallery, and/or The Portrait Gallery and appreciate that you have access to some of the best museums and galleries in the world for little if any cost and incredibly close to you. Take advantage of that! The Monastery from one of the many high points with a view. 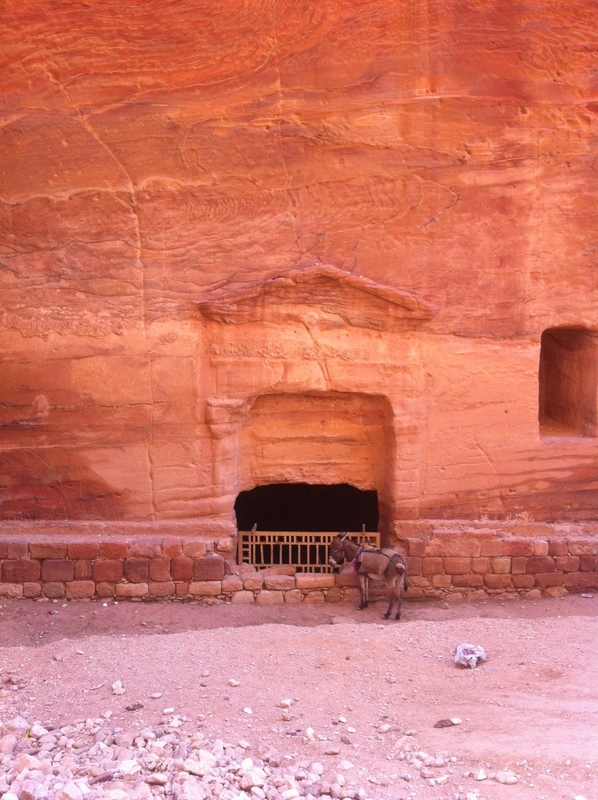 For more (actual, factual) info on Petra have a look-see at the UNESCO World Heritage website. ← Sam’s poetry is coming along. Absolutely stunning!! Thanks for Heritage Website – full of terrific information!